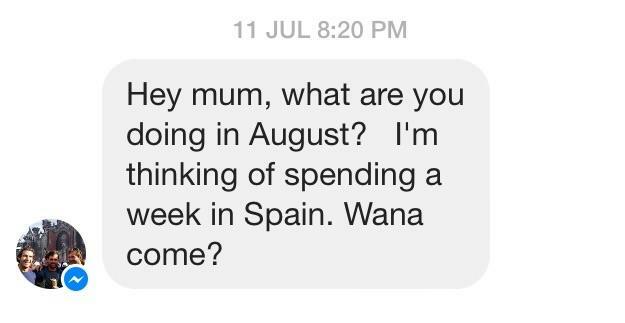 "Hey mum "the message read, "what are you doing in August I'm thinking of spending a week in Spain. Wanna come...?" I could think of a million reasons to go and not one good one to stay home and work and now, not so many weeks later am on the first of many Emirate flights. He complained gently about needing to know all the dances in the world because a "gentleman host" is expected to dance the night away. Imagine having to sit through tedious accounts of grandchildren and pets and previous husbands! I may have mentioned india to him - and partway through the flight he hunted me down to get contact details of Children's Homes he could visit and help at. He'd been thinking he said! As of yesterday Emirates have broken relationship with Jet star Asia. Which would usually mean nothing to me - but today means a worry- no longer are bags checked through with both airlines. I have 1 hour 20 mins to collect my bags in Singapore and check in again for the next flight to KL. The check in girl prepared me with some anxious looks, a seat at the front and wheel chair tags on my bag.